You might be playing Scrabble, and you're faced with the drecky rack A-A-E-U-O-C-I. What is the biggest vowel-dumper available to clean up this mess? 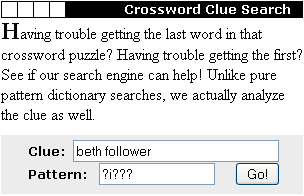 You're faced with the crossword clue 'Beth follower', and you know the answer has to be a five letter word with an 'I' in the second position. You are writing a limerick about 'A man from Kathmandu' and you need some words that have the right rhyming sound and number of syllables to do the job. You're in the middle of writing a research article and suddenly you've had a mental blank. You know there is a word meaning 'near the coast', and it's on the tip of your tongue, but you just can't recall it. And I'm sure you can think of plenty of others! But where do you go to reliably solve these problems? Perhaps the most common approach is to just hit Google. That's not too bad for some problems, but it tends to be a bit hit-and-miss, and in some cases it's totally unsuitable. Besides, you might not have internet access. What to do? The best answer is to have a swag of reliable word finders at your disposal. I don't just say 'a swag' for the obvious reason that if one tool fails, another might succeed. The main reason you need to have several word finders is because all of these tasks require completely different search technologies, and if you want reliability, you need a tool that's been tailored to the specific task you want it to perform. Also, you want to have both online and offline tools at your disposal to cater for situations where you don't have, or want, to use the internet. So what I've done on this page is describe the best word finders I've found on the Web over the years. I'll explain why I use each one too, so you'll see why it's handy to have a few of these gadgets up your sleeve. Its Area of Specialty - Is it designed primarily for Unscrambling Anagrams, Solving Crosswords, Matching Word Meanings, and so on? The power of its Pattern Search Features - Does it just let you specify how many letters in the word, or does it support a sophisticated pattern-matching syntax. 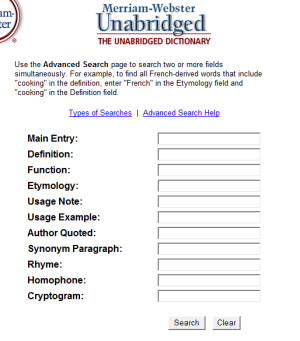 The breadth and quality of its Dictionary Base - Does it use a high-quality dictionary? Does it tell us which dictionary it's using? Does it let us select a dictionary? Whether it uses Online or Offline technology - Do I go to a web page and enter in my search criteria there, or do I open up an application on my PC? Zyzzyva is a free tool designed primarily for Scrabble players. Although I am only going to focus on its Scrabble word finder functionality here, it is also a dedicated word-study program for Scrabble players, as well as a handy word judge for adjudicating tournaments. Actually, you can add as many criteria as you like, and there's a whole bag of tricks that goes beyond the example I just described. Basically, if you want to solve a particular Scrabble rack, or generate a handy list of Scrabble words, it's pretty hard to beat Zyzzyva. You can download Zyzzyva here. You can also read my interview with Zyzzyva's creator here. Unlike Scrabble word finders, these tools are dedicated to solving crossword puzzles. The real magic of a good word finder for crosswords lies in the extensiveness of its database of existing crossword clues, and its efficiency in searching that database and judging the likely relevance of the candidate answers it returns. Now, remember how I emphasized earlier that a good word finder is completely dedicated to a particular type of task? Well, here's a good example of that principle in action. Even in the restricted world of crossword solving, you need to think about whether you're solving American Style (Standard) crosswords, or British Style (Cryptic) crosswords. The intelligence behind solving a cryptic is completely different to that required in solving a standard, and different tools have therefore evolved for each purpose. Crossword Maestro is the Creme de la Creme of the Cryptic Crossword solving realm, but when you enter clues from a standard crossword into it, the results are not overly impressive. Conversely, if you're trying to solve a cryptic, you'll have a pretty low success rate if you enter your clues into One Across (a first-rate American-style crossword solver I describe below). As the One Across folk openly acknowledge on their website: Note that One Across does not perform as well on Cryptic or British-style crosswords..
After a small wait (for the example in the screenshot it took about 2 seconds) One Across returns a list of candidate answers with a score for each one, indicating the confidence the word finder has that the answer is correct. It also provides some information about the source of its guess. In this example, One Across is very confident that the answer to my clue is GIMEL, because it has seen this clue before. Crossword Maestro is a word finder for solving cryptic crosswords, and is widely regarded as the best of its type in the world (not too surprising, since it was created by the same renowned artificial intelligence expert as Anagram Genius). Unlike One Across, which is an online tool, Maestro is an offline tool. In other words, it's a standalone application that you download to your computer and you don't need to be connected to the internet to use it. 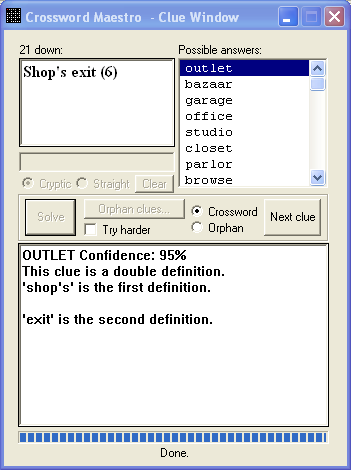 In other words, you can use this tool as a kind of cryptic crossword tutor that solves a cryptic crossword in front of you, explaining all the tricks and techniques it uses along the way. You can get Maestro here. This section is for that huge miscellany of tasks that, unlike Scrabble and Crosswords, relate more to spelling and vocabulary as they occur in everyday conversation and writing. Rather than throw it in the bin as I normally would, I took the time to read what it said. I'm very glad I did. It was a complimentary one-year subscription to the online version of the dictionary (not the freebie online Merriam-Webster - the unabridged Webster's online!). Now, I have enough monthly subscriptions pounding my credit card thank you very much, so the pleasant surprise that this subscription comes FREE with the physical dictionary led to the addition of a great word finder to this page. Now, if you click on the Advanced Search option of Webster's Online, here's the word finder that pops up - don't be misled by the plain-old-vanilla appearance of this form, because what it can do is just fantastic! I can now search through almost half a million words of America's most respected dictionary using criteria only dreamed of by Spelling Bee contestants: Words that rhyme, words that come from the same language, words that are homophones, and so on. Well, that's the first few of the 914 words found - but I think you get the drift, right? If you're entering an American spelling bee (which generally use Webster's Unabridged as the final authority), or if you're just really into orthography (look it up! ), I recommend you go without food for a few days if necessary to add the beautifully bound and presented Webster's Third New International Dictionary to your bookshelf, and get free access to this terrific word finder to boot! 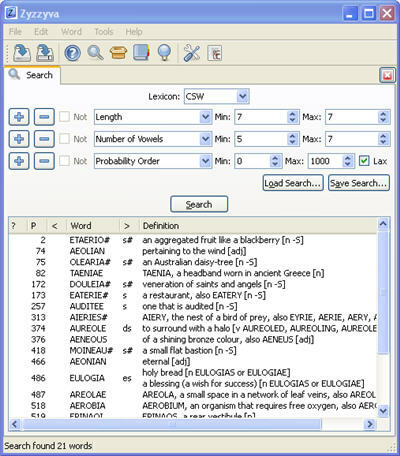 WordWeb Pro is a program that puts just about all the dictionaries and search functions you'll need under the one roof. It can run in offline mode using its built-in dictionary (plus any add-ons you've selected), but also runs in online mode by connecting to a bunch of top-notch look-up sites (One Look, Wikipedia, etc. ), keeping each one on a separate tab in one neat-and-tidy package. 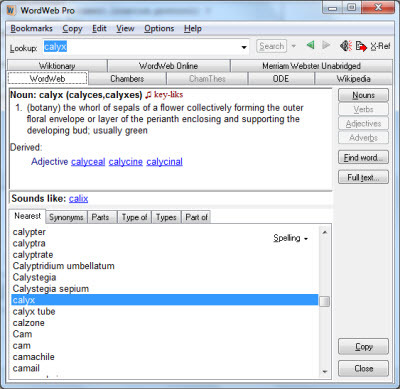 Because it works both offline AND online, and since you can integrate so many other dictionaries, word lists, and websites into it, WordWeb Pro really deserves the name 'One Look'. (In fact, the popular One Look website is integrated into WordWeb Pro!) Although when I think about it, the name does make sense - it really is a kind of mini-web dedicated to words. P.S. This review is based on WordWeb Pro. A free version of this product, called WordWeb (without the Pro), is also available, however it does not contain all the functionality I describe here, and I do not recommend it except as a kind of taste-test. Find out why I reckon this program is the most powerful vocabulary builder on the market today. Learn how expert Scrabble players score 50 bonus points in virtually every game. Two time US Memory Champion reveals a technique anyone can use to recall just about anything.